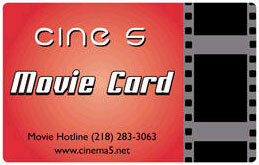 Give the perfect gift for any occasion, the new Cine 5 Movie Card. It's good towards movies and concessions and are available in a variety of dollars increments. So, you can catch the latest blockbuster movie or use it to enjoy delicious, buttery popcorn or a refreshing soft drink. 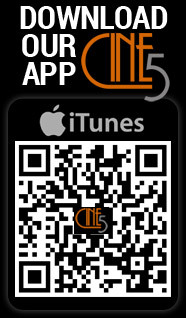 To purchase the Cine 5 Movie Card, just stop on by the Boxoffice.